GSD Associates Ltd is a Sage Professional Developer with high levels of expertise in the implementation and support of Accounts software. When we first became a Sage Developer we thought that we would simply integrate our software products with Sage and leave the training and support to Sage resellers. 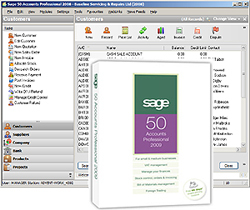 In practice we found that many of our clients (who purchased Sage 50) believed that we had a higher level of expertise than their Sage reseller due to our background in developing and supporting accountancy software. We decided to respond to market demand from many clients who wanted us to do their Sage training and support. As a result we offer full consultancy, training and support services to Sage 50 clients. and supporting Sage 50 since 2003. Should you be interested in either our services as a Sage Developer or need Sage training and Support services please do not hesitate to contact us.